Winter fruit in California is maybe not quite so varied as summer fruit, but with satsumas, pomegranates, and pears, I’m not complaining. This winter, I’m also optimistically awaiting a new addition to our winter fruit menu: the quince! 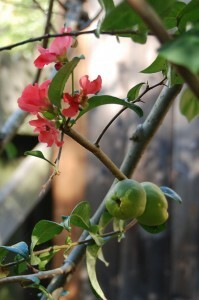 After years of beautiful flowers from the raggedy little tree in the far corner of our narrow city backyard, this year, our little quince tree has set fruit, and a couple have even survived the squirrels and other urban predators to make it close to harvestable size. So I got to work, researching the quince. The LA Times ran a feature story on quinces and another article reminded me of their place in poetry; my mom sent some recipes, and I also read happily about fried quince pies and my friend’s baked quinces. In the end, though, I used a cookbook straight from my bookshelf, Deborah Madison’s wonderful Local Flavors and found a recipe for poached quinces, so that I could cook with some now, and save some for later. Rub the fuzz, if any, off the quinces. Using a good sharp knife, cut away the skin in long strokes, like you would an orange peel, saving the skins. Remove the center with an apple corer, if you have one, or simply cut the fruit off the core in big chunks, and then slice into wedges about 1/2 inch thick. Put the skins and cores into a saucepan with two quarts of water, bring it to a boil, then simmer, covered, for 30 minutes. Strain. Return the liquid to the pot and add the sugar, spices, and orange zest. 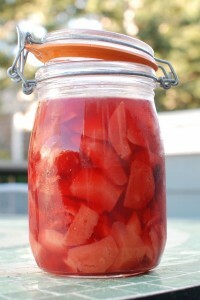 Stir to dissolve the sugar, then add the fruit. Place parchment paper of a heavy plate directly over the fruit to keep it submerged. Lower the heat, cover the pan, and simmer until the quinces have turned pink and are slightly translucent, 2 to 2 1/2 hours. If the syrup becomes too thick, add more water as needed. 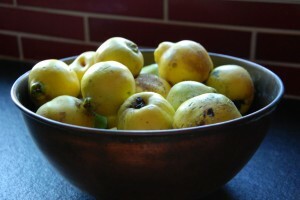 When done, store the fruit in its syrup in the refrigerator; the quinces should keep for two months. Roll the chilled pastry into a square 1/8 inch thick. Place it on a sheet and refrigerate until ready to bake. Peel, core, and slice the apples into 1/4 inch wedges. Peel, core, and slice the pears into slightly thicker wedges. 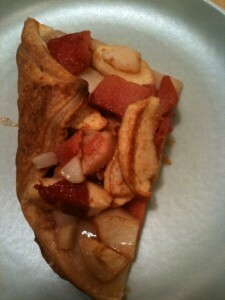 Toss all the fruits with the cinnamon and sugar. Remove pastry from the fridge and loosely arrange the fruit in the middle, drizzle the butter over it, then pull the opposite corners toward each other; they won’t meet. Bake for 15 minutes, then reduce heat to 375 and continue baking until the pastry is puffed and golden and the fruit is tender, about 35-40 minutes. I still have more poached quinces to bake into tarts and crisps, sweets that will tide us over while we await our own quinces. We are being very patient, and look forward to the day, some time in the next couple weeks, when the kids and I will pick our own small quinces, our first backyard fruit harvest.